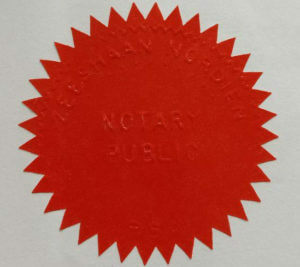 An close-up of an actual notary public seal as part of a legalisation. What is meant by legalisation of a document? In essence, legalisation generally relates to the process of making sure a public document is verified, usually for usage in another country. For example, a public document like a SAPS Police Clearance, needs to be verified by a means that the foreign country can trust. Such means include apostilles and other legalisations. Sometimes the document is used overseas in a country that is part of the Hague Convention and is therefore apostilled. If the country is not part of the Convention, a Certificate of Authentication is issued. A High Court or Foreign Embassy can often be the signatory for such a legalisation. This is covered well on the page linked above – click Apostilles to read more. One of the main duties of a Notary Public is to affirm and attest to the authenticity of certain documents. An example of such a document is a passport copy. Usually, the person who is receiving the notarised document has to be present during the notarisation. Various countries require documents to be affirmed in the presence of their representatives in the foreign country. Most often, the representative office is their embassy, and thus embassies often have a section where they complete attestations to various documents for usage in their country. The Department of International Relations and Cooperation (DIRCO) and the High Court are usually the bodies of state that can authenticate public documents (but not other documents – those are mostly done by a notary public). If you are confused about the difference between apostilles, notarisations, attestations and legalisations, read our blog post covering the topic. By clicking on any of the above legalisations, you can see a description and the services we offer, often in as little as 48 hours. Please remember to check clearly which documents you need legalised and in what way, since this cannot be determined by us or any authority other than the one asking you for the legalisation. See our pricing.